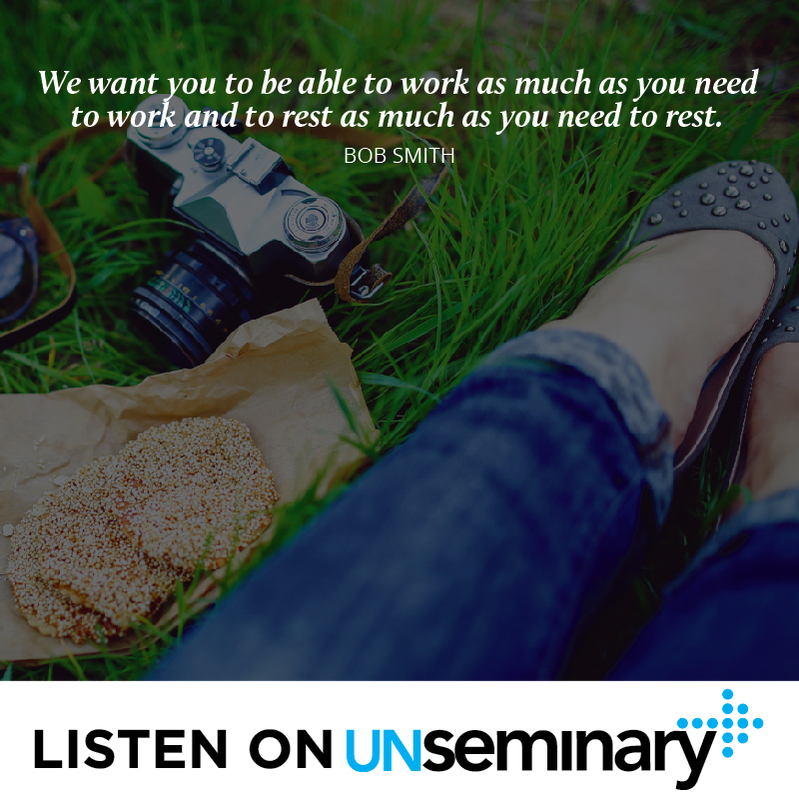 Welcome to this episode of the unSeminary podcast. Today I’m excited to have Bob Smith of 2|42 Community Church on the show. 2|42 Community Church was started in 2005 and has been one of the fastest growing churches in the country for a few years in a row, now having about 4,000 attendees. Bob was the campus pastor at the largest campus in Brighton for the last five years, but he now focuses on the business and development side of things. Bob is here today to talk with us about how they keep things simple at 2|42 Community Church, even with their growth and expansion. Think like a new church plant. // As Bob says, one of the ways 2|42 Community Church keeps things simple is to think like a new church plant and really value people on the edges of their ministry. With about 50% of their attendees having no real relationship with God yet, but being spiritually curious, 2|42 is laser focused on the mission to reach the lost rather than engage people’s personal preferences. They keep asking themselves: What does it look like to start a new church and reach people who are far from God, rather than just expanding an already established church by transferring people? Church-wide focus. // 2|42 is a staff led church. They have a team of leaders who guard the mission and keep things running in the direction the church wants to focus. But the lead team is focused church-wide rather than on individual campuses. This means that everyone works together to ensure the success of the entire church and no one on the lead team has a stake in just one campus. Find new ways to grow in an entrepreneurial spirit. // Bob reminds us that it’s easy to keep up an entrepreneurial spirit with a new project. People get excited about starting a new church or a new mission project and will give their time and money. But that spirit wears off and so you need to find new ways to grow and revive that excitement once again. While 2|42 Community Church is centrally controlled and its campuses operate more as “company stores” than franchises, they realize future growth will require them to create systems which empower campuses to think more like entrepreneurs themselves and come up with their own ideas while still maintaining & distributing high quality content from Central. Part of that means establishing goals at the central level and then allowing ministries and campuses the liberty of figuring out how to execute on them. This helps keep everyone engaged, builds excitement and encourages leadership. Think about cultural fit. // When adding new people onto your staff or volunteers, Bob says that we need to think about “cultural fit” – more well-known as “chemistry” to people. Determine how the person fits not only into the larger staff, but into the particular department they’ll be joining. Also consider what sort of entrepreneurial skills they have – what kind of a problem-solver and self-starter are they? You can learn more about 2|42 Community Church at 242community.com or contact Bob by email. 01:06 // Rich introduces Bob Smith and welcomes him to the show. 01:34 // Bob talks about his new role at 2|42 Church. 02:22 // Bob gives us a flavor of 2|42 Church. 03:22 // Bob tells us how the church manages to stay focused on their two core values. 04:31 // Bob talks about the Lead Team. 06:20 // Bob explains the staffing structure within the church. 08:23 // Bob talks about the process they use to develop staff. 11:14 // Bob talks about the attributes he looks for when hiring staff. 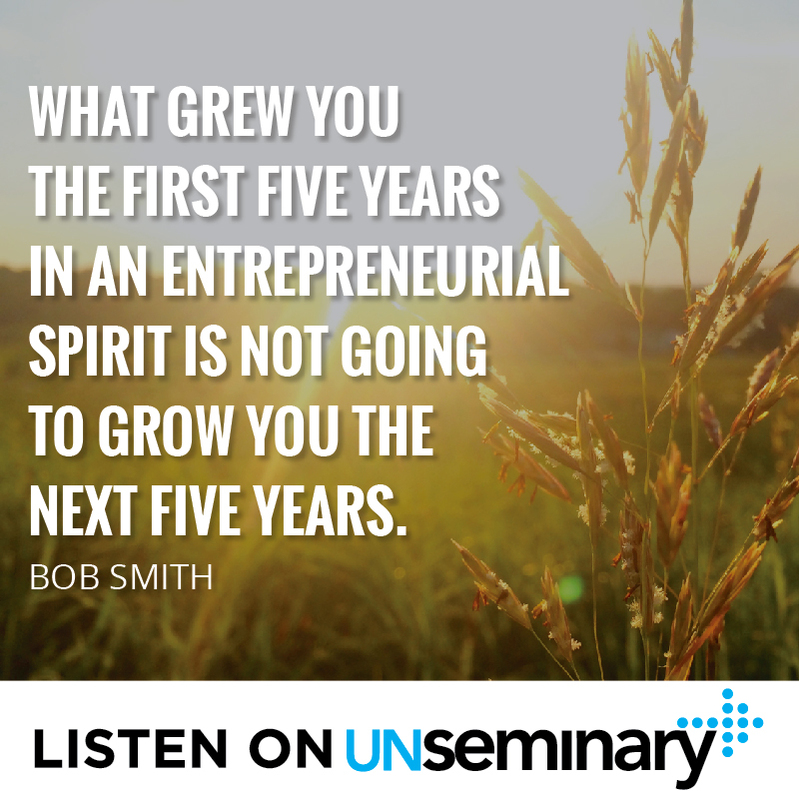 Rich – Hey everybody, welcome to the unSeminary podcast, my name’s Rich, the host around these parts. Thank you so much for taking time out, to be on and to listen in on today’s episode. We know you’ve got a lot going on and we’re just honored that you would take some time out to listen in. Today I’m excited to have Bob Smith with us. Bob is at 2|42 Church, a fantastic church. If you’re not following them you really should. Welcome to the show Bob. Bob – How are you doing? I’m glad to be here. Rich – This is going to be great, I’m so glad to have you here. So 2|42 church is a great church, it stated in 2005, it’s really rapidly growing, a couple of campuses, I think you may be eyeing one in the future, about 4000 people attend, so a significant church. Bob why don’t you tell us about your role there at 2|42? Bob – My role has just evolved. For the last 5 years I was a Campus Pastor for the largest campus in Brighton. We’re about 4200 people, this campus and I had always been part of the Leadership Team when the church started, but I had a 27 year career to go into the ministry. My role has just evolved to just focus mostly on business and development. Bob – The development side is going to be new church work, new residents planting, internships, missions and things like that. So that’s what I’ll be focusing on going forward in the future. Rich – Cool. Well why don’t we start, give us a sense of 2|42. For people that don’t know the ministry give us a flavor for the church there. Bob – Well I think what we try to do the most is to be able to focus on people who are far from God. I would say that probably about 50% of the people who attend here on the weekend have no real relationship to Jesus Christ yet. Bob – They’re spiritually curious, they’re just trying to figure things out, so we really focus on the mission more than we ever do people’s preferences. When I say preferences, there’s a lot of churches out there that if someone comes forward and says, “Hey we want to do a women’s ministry, we want to do this ministry, we want to do that,” if it doesn’t fit the ideal that we want to value people on the fringe more than people at the core, we’ll probably not going to end up doing it. So we try to be a really simple church, weekend experiences and small groups. That’s about the two main things that we do. Rich – Now how are you able to keep that focus? I think a lot of churches talks about a simple church, but at a church of your size, how are you able to do that? What are some of the mechanisms that you’ve been able to do that as a church? Bob – Well I think our Lead Team stays pretty laser focused on those two core values and to be able to work through those and I think we have internal checks and balances with our team, if something sounds like it’s going beyond what we try to do, the other guys in the team will just tell you and begin to shut that conversation down and just be able to guide it back to it. One of the things that really helps us is, we try to think like a church plant, even though we’ve been around for 10 years, so it’s always getting back to, “What does it look like to multiply more churches, start churches, grow the church, reach people who are far from God?” as opposed to just transfer growth or anything else. Love it if all of those people would stay at the churches that they’re at and just send those other folks to us so we can maybe just equip or work together to reach those people and grow the kingdom. So we talk about that all the time and we’re pretty laser focused on it. So we want to check ourselves on that. Rich – Yeah absolutely. Now how are you kind of structured from a leadership point of view? You talked about the Lead Team, how does that work from a governance point of view, how are you making decisions within 2|42? Bob – Yeah, so we’re a staff led church, most large churches are today. We have elders but they really just guard the Senior Pastor, they’re his Caledonia team and things like that. They might be some of the first to hear what’s going on but they don’t have a vote, their role is really just to come alongside the senior guy and guard him, guard his heart and guard the mission. Our Lead Team is comprised of 5 guys. The Senior Pastor who acts as the CEO, this is our lead board, our board of the church. I act as a treasurer and besides that I have the Teaching Pastor who teaches teams in creative arts and I have a campus guy who looks after our campuses and small groups, another guy who does family ministry, who we just kind of talk about, he does diapers to diplomas. Rich – That’s a great phrase, I like that. 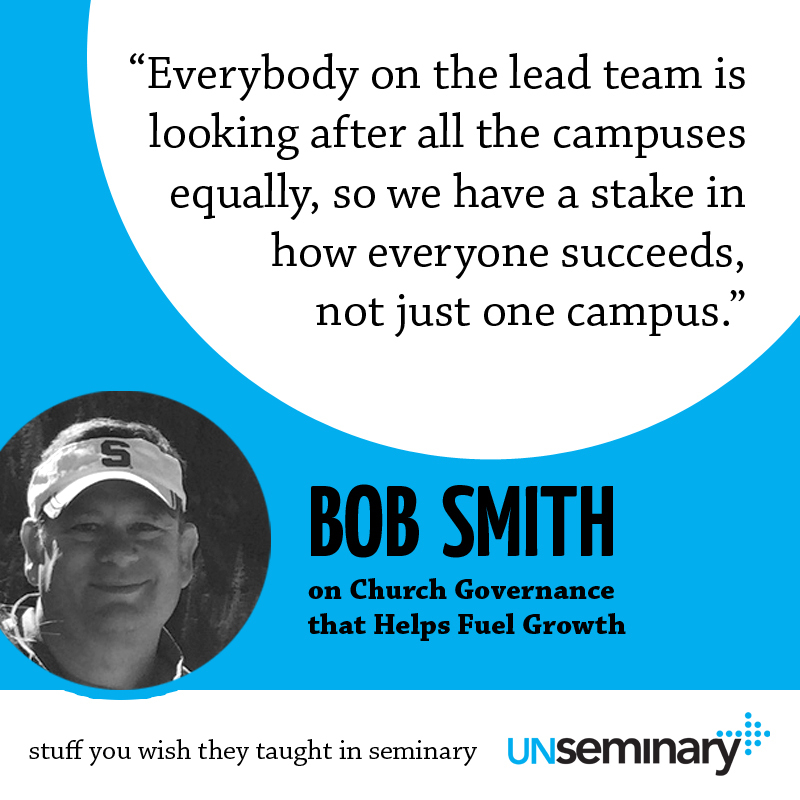 Bob – What’s really nice is the Lead Team functions church wide as leadership. So we don’t have Campus Pastors on our team [Inaudible 00:05:37] like that who are positioning themselves to take care of their campuses in the best way. So everybody in the Lead Team is looking after all of the campuses, church wide, equally, so we have a stake in how everybody succeeds, not just one campus versus another. Rich – Interesting. Now at that voluntary level, there may be some people that are listening in that are saying, “That’s interesting about the way you have your, kind of the volunteer board structuring to kind of guard the Senior Pastor,” and I know that’s very similar to how we’re structured, we’re staff led as well, but can we kind of dig into that? Has it always been like that at 2|42, right from the beginning? What has that process been like for you? Bob – When we started, we launched about 10 years ago. We had a management team that was made up of myself, the Senior Pastor and some guys outside, some other Senior Pastors from other churches and things like that, who just kind of gave advice and counselled as we launched. It took us about 6 and a half, 7 years before we started to appoint elders and at that time we just kind of allowed our management team, those senior guys, when other churches begin to drop off as new guys came on from within our church. But the ideas were, we wanted people who had proven us to be with us. That takes a while to do as a church evolves and things like that. One of the best things, I have two guys on the team who are former elders from previous churches, who would never accept again a traditional elder’s role. Bob – So when we told them what we’re looking for specifically, they were really excited about that, because I’m a recovering elder myself and that’s just a tough role, especially if you’re trying to lead through a committee, as a senior guy in a church who’s struggling and he’s got to be more of an employee than actually the visionary and I think that this structure really allows a senior guy to feel comfortable about sharing what’s going on in his life, you know, that accountability. Often, where you have an eldership that is looking at the staff as their employees, as an elder led church, if you start talking about the chinks in your armor and where things aren’t going well, some of those guys are thinking, “Well that may not be long term,” it’s more of an employment issue rather than a spiritual issue. Bob – So I think the way we do it, it really helps us stay in the spiritual side of things and the accountability side. Rich – Absolutely. Then what is the kind of planning process, like how are you developing plans on the staff side of that equation and what does that look like? What’s the rhythm in there and how do you interact with them, obviously you said they’re coming from the folk, the first people to be informed of that, what does that process look like for you? Bob – For the elder team? Rich – I would say on the staff side, from a kind of leadership side with the staff side, yeah. Bob – So the Lead Team, we meet together every week and we have an all staff meeting once a month, with all the staff at the church, 40 or 50 people show up. But what you’ll find us doing a lot of is really trying to, and it’s easy to say and do this, just to empower the different ministry teams, whether it’s at campus level, community life which will be small groups, family ministries, empowering them to come up with stuff themselves and be entrepreneurial. Yet with a structure like ours, the conflict that arises is that we are a very central controlled church, our campuses are franchises, they’re more company sourced, so it’s high degrees of control in campuses basically just affect the content that we give them, they execute that content. It’s really important as we look at, we grew probably on the strength of the entrepreneurialship of our Senior Pastor and the Lead Team in the first 5 years, but what grew you in the first 5 years in entrepreneurial spirit is not going to grow you the next 5 years. So we’re trying to figure out and work to create systems where we can give opportunities to be entrepreneurs at the lower levels of community life, family ministry, children’s ministry, arts and things like that but yet still trying to control the high value central, so that we can have great content and excellent music and just that high level of execution. So we’re trying to figure that out and begin to push a lot of that content down. I think mostly what we’re trying to do is establish goals at the central level. Rich – Absolutely. Obviously a big part of an empowered system like that is finding great people. What are you looking for as you kind of find people to come on your team, what are some of those attributes of the kind of people you’re trying to bring onboard? Bob – Yeah that’s a great question. One of the things that we’ve been talking a lot is about cultural fit. A lot of other people call that chemistry, but I think chemistry is more of like, do I like the guys? Bob – Do I like those guys who are coming on and things like that? But when you start getting larger and you’re getting more into the 50 staff members and things like that, I think cultural fit is probably one of the best things you can begin to look at, whether or not they hustle. Bob – That’s good, I might steal that, as a former cop I used to look at a lot of cars. Bob – That’s real good, I’ll enjoy it, look for evidence. Bob – So one of the things that we try to think about is, it depends on the department somebody’s going into. Bob – If it’s a department and they’ve got a community life or small groups, they’re a little bit more bureaucratic and they have a lot of tasks they have to accomplish as they’re coaching small group leaders and network leaders and things like that, so there’s a lot of benchmarks that they have to be able to hit and things like that. So there’s probably less opportunity to be entrepreneurial, so would I look for an entrepreneur to be in that role right now? Probably not, I’m going to look for someone who can execute operationally, someone who understands maybe a more pragmatic approach, if that’s what we’re trying to do. Bob – Our family ministries have a great success finding it a little bit more entrepreneurial than our youth ministries, our children, as they begin to figure out what they’re going for. As an example, we have a one to one special needs ministry. Bob – It was birthed out of the children’s program as just a need and that was just a great opportunity that they saw that we didn’t see to connect to part of the community that we were missing. So we really kind of narrow this down and one of the things too that we find in our organization is, we probably don’t succeed well enough to mentor in the position to say, “You need to do this and this and this to progress.” So I’ll probably be looking more for someone who’s a self-starter, high initiative and things like that. That way, if it’s not my culture right now in the church and we’re not doing this well, I’m not just going to staff with somebody who needs a lot of that, someone who needs to be able to be guided more. I’d probably look more for a self-starter and someone who can just figure out what he needs to do or what she needs to do without constant input. Rich – Very cool. Well this has been a great conversation so far. When you think about kind of governance and how your team structure fits together, is there anything else you’d like to share with our listeners before we move on with the rest of the episode? Bob – You know, as we talk governance, one of the really interesting things about 2|42 is I don’t even have an employee handbook, I have no vacation time, I have no sick time. So at some point, I mean I have a draft book ready to go, when we’ve figured out like, “This is really important,” but just a culture, not that we’re a startup, because I don’t have that level of freedom in experimentation yet, but the idea that a high level of trust and we want you to be able to work as hard as what you need to work and rest as much as you need to rest. Bob – Often we tell people, “Well you can take up to 3 weeks’ vacation or something like that, just take it when you need it,” and they’ll come back and if we watch, they won’t take it. So we had to encourage people to take that time really, because it’s just a different animal for a lot of our folks, they work really hard. We’ve been in a season of busyness for 10 years, there’s a lot of churches, there’s an ebb and flow and things like that and we don’t seem to have that yet, which is a kingdom problem, but it’s still a problem that you’ve got to look after.